Fine jewelry can be beautiful and interesting. It shouldn't be bland or boring. That's why you'll usually find Randy Polk's designs exhibited at art shows alongside award winning paintings and sculptures. Never in look-alike mall shops. Randy's designs are not for conformists. You'll find a wide variety of unique designs and exciting styles. Look at them in this online showcase and decide for yourself. Are you confident enough to make a statement by wearing a colorful piece of fine art as jewelry? Other jewelers said it couldn't be done, but Randy's wife Kitsana showed them. In putting the pearl inside the ring, she created our all-time best seller, "Covergirl". Randy's designs prove that even understated and somewhat traditional designs can have sizzle and excitement beyond the sum of their parts. Traditional standards of beauty can be interpreted in fresh ways, so classical styling never needs to be boring, unimaginative, or lifeless. Anything but! Breathtakingly beautiful. 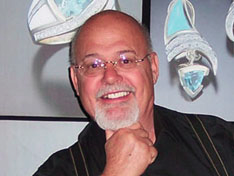 Randy's designs feature brilliant certerstones, surrounded by glittering rows of diamonds and perfectly matching inlay. Shape, color and texture embrace in the perfect marriage of sensual design in Randy's luscious jewelry creations. It's romance you can wear. Randy has scoured the earth for inlay materials to harmonize perfectly with centerstones, often using materials never before seen in fine jewelry. Very few jewelers can or will attempt this type of inlay. It's so beautiful to look at, but so difficult to do with this degree of precision. The precise blending of exotic colored inlays mean Randy's inlays complement without overwhelming the focal point. Sweeping organic curves and whimsical geometric shapes prove that jewelry doesn't have to sacrifice elegance for light-heartedness. The sculptural simplicity of Randy's ground breaking creations trancend the concept of fine jewelry and becomes a work of modern art. Why settle for anything less than art? The brilliance of Randy's choice of centerstones is only matched by the quality of diamonds that complement them, for an unparalled combination of lustre and sparkle. Watch this video, as Randy shows how he creates his beautiful jewelry, from carving a wax to a dazzling, finished 18 carat gold ring with inlay. Creating excitement in the art world.